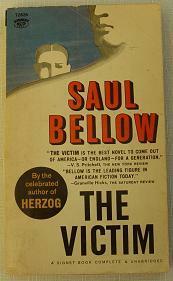 The Victim by Saul Bellow is the story of Asa Leventhal, left on his own by his wife who is visiting family out of town. Leventhal is at loose ends until he bumps into a former acquaintance Kirby Allbee whom he does not recognize at first. Allbee is down on his luck, drinking suspects Leventhal who is unsympathetic. Allbee confronts Leventhal, blames him for his ill fortune because he once got Leventhal a job interview only to find out that Leventhal insulted his boss rather publicly. Allbee was fired soon-after and still holds Leventhal to blame for what followed; Allbee lost his wife and has not been able to find a decent job since. He is at the end of his money with no where to turn. So he latches on to Leventhal. Leventhal feels guilty for what has happened, or rather he feels that others may have a low opinion of him because of it, and that if he can help Allbee their opinion of him may improve. Leventhal is continually motivated not by what he thinks is right but by what he believes others will think of him. Allbee soon becomes the guest who wouldn’t leave, showing up at all hours, asking for increasingly intrusive favors from Leventhal, eventually moving into his apartment. Allbee is never grateful for Leventhall’s help, he continues to blame him and to suggest that there is a Jewish conspiracy against him. How long Leventhall will put up with Allbee and how far Allbee will go are what make up the conflict of The Victim. Just who is the victim here Allbee or Leventhal? At what point do their roles reverse? This is an interesting conflict up to a point. I soon found myself having a very hard time with Leventhal and with the book itself. It is a bit of a period piece, and one supposes people may have willingly let near strangers move into their New York apartments in 1947, but who would put up with a “charity case” that insults their race openly? 1947 was a different time, true, maybe people were used to that sort of thing then, but I would have kicked Allbee to the curb by page 150, while Leventhal does not stand up to him until 100 pages later. The Victim is very well written, this is my first exposure to Saul Bellow–I think I’ll be back for more, and it is an interesting window into the Jewish community of the 1940’s. But I found the novel frustrating and surprisingly difficult going much of the time. This review was first published on my old blog, Ready When You Are, C.B. in 2008. Since then, I have not gone on to read any other books by Saul Bellow.